Japan has a unique problem—well, Japan has a lot of unique problems, but we're only going to tackle one here. Specifically, it has generally rugged terrain and generally crazy population density. And although Japan's population is generally shrinking, it still needs to build infrastructure, namely airports. What to do? The solution is certainly not to use eminent domain rights, as countries like China and India have gained infamy for doing. Japan learned this the hard way about 40 years ago, during the construction of Narita Airport near Tokyo, now the country's busiest international hub. Local farmers still stake their claim to some of the land on the airport's grounds, which means that it is technically still not complete. Japan is at least as famous for its engineering as it for things that are cute, weird, and delicious, so the strategy the country's top minds took shouldn't surprise you. They took advantage of Japan's greatest national resource—the sea that surrounds it on all sides—and simply built the airports there. Well, after building artificial islands for them. Here's a look at Japan's most notable floating airports, and some other places where their technology has been successfully applied. Osaka-Kansai International Airport, which serves an area that also includes the tourist-friendly cities of Kyoto and Nara, is probably Japan's most famous floating airport. Thought up in the 1980s shortly after the Narita Airport debacle, Kansai Airport required more than seven years of construction, a seawall of 48,000 tetrahedral concrete blocks and 21,000,000 cubic meters of landfill to ensure not only that it stayed above water, but that the artificial island could withstand the earthquakes and typhoons to which Japan is prone. The result? Japan's fifth-busiest airport and the world's longest airport concourse, among other accolades. The good news is that the engineering has proved sound against natural disasters, namely the devastating earthquake that shook nearby Kobe in 1995. The better news? Although the initial sinking rate of the airport was much faster than engineers initially compensated for, it's slowed in recent years. Although Nagoya's Centrair (short for "Central Japan International Airport") was technically Japan's third floating airport (more on the second in a few paragraphs), its 2005 opening was the highest profile after Osaka-Kansai, as it serves the highly populated central Japan ("Chubu") region around the city of Nagoya. As of 2016, the airport receives the only other scheduled flight to Japan from North America aside from Osaka and the two airports serving Tokyo: A nonstop Delta flight from Detroit. Japanese engineers certainly learned from the challenges of Kansai Airport—Centrair Airport has been mostly free of the engineering problems that plagued its older sibling, and construction on it was significantly cheaper as a result. Kobe's airport was even easier than Osaka's or Nagoya's, although this has as much to do with the fact that it opened 12 years after Osaka-Kansai as it does that Kobe is simply a smaller airport than Osaka: It serves only a handful of domestic destinations. Indeed, since Kobe is part of the larger Kansai region, international passengers ride Japan's amazing rail network across the bay to Osaka-Kansai airport. It remains to be seen the extent to which the amazing earthquake-proofing engineers did at Osaka-Kansai has been replicated at Kobe Airport. Here's to hoping we never have to find out—it's difficult to imagine any floating structure not sinking in the event the 1995 Kobe earthquake reprises! The island of Kyushu is home to two of Japan's floating airports: Nagasaki (which was the aforementioned second one built); and Kitakyushu, which serves a city that only true Japan aficionados will—this flower-filled tunnel is a staple of many a Japanophile's bucket list. Nagasaki Airport is unique on this list because at least part of the island it was built on existed prior to construction. 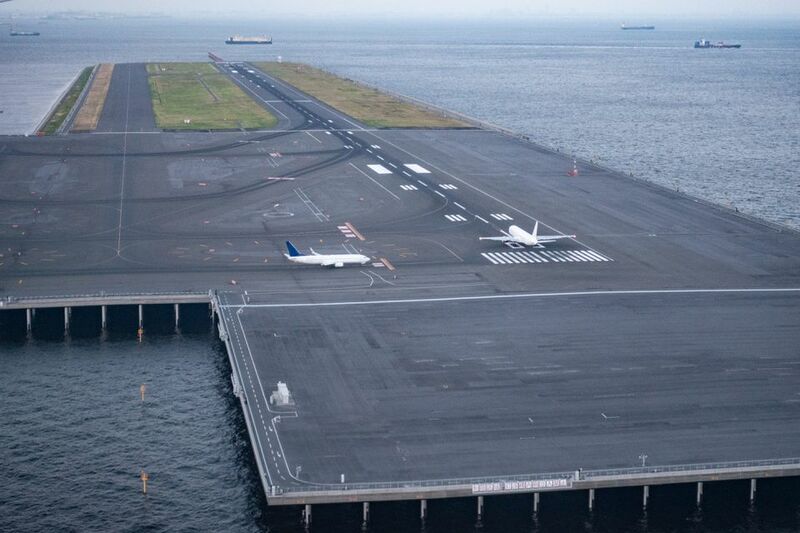 Kitakyushu Airport, on the other hand, which like Kobe Airport opened in 2006, was built on an island made from scratch. Both of Kyushu's floating airports have relatively low traffic. Kitakyushu's only scheduled service is to Tokyo and Nagoya, while passengers at Nagasaki Airport can travel to international cities like Seoul and Shanghai, in addition to cities throughout Japan. Japan's got a lot of sea left, and many of the country's busiest airports are at capacity. This is especially true in Tokyo, given the aforementioned fact that Narita Airport can never be fully finished. To be sure, while Haneda Airport (which is closer to the city) is being more liberalized in advance of the 2020 Olympics, there are limits to how much it can grow. It's not surprising, given this information, that many proposals for a floating Tokyo airport (most notably "Megafloat," which died in 2008) have been proposed. This would, of course, require even more complex engineering than other airports on this list (Tokyo Bay's geography makes it uniquely prone to tsunamis), but when it comes to Japan, it seems there ain't no mountain high enough. Outside of Japan, the most notable floating airport is probably Hong Kong International Airport, opened in 1998 to replace Hong Kong's congested (and for pilots, treacherous) city airport. Hong Kong faced substantially fewer engineering challenges than Kansai Airport, as its developed studied and learned from the builders of Kansai Airport. As far as future floating airports outside of Japan, the sky is really the limits. Ideas have been floated (pun very much intended!) for floating airports to serve congested metro areas like New York and London. Actually, scratch that, the sea is the limit. After all, although we've been referring to these airports as "floating" airports, they're actually sinking, by design at that. If sea level rise keeps at its current pace, we may need to develop an entirely new approach to island airports.